Again we were in the Cour du carrousel of the Musee du Louvre in the 1st Arrondissement of Paris, when we took these high definition photos showing a statue called Guerre, which was sculpted by Barthelemy Frison. 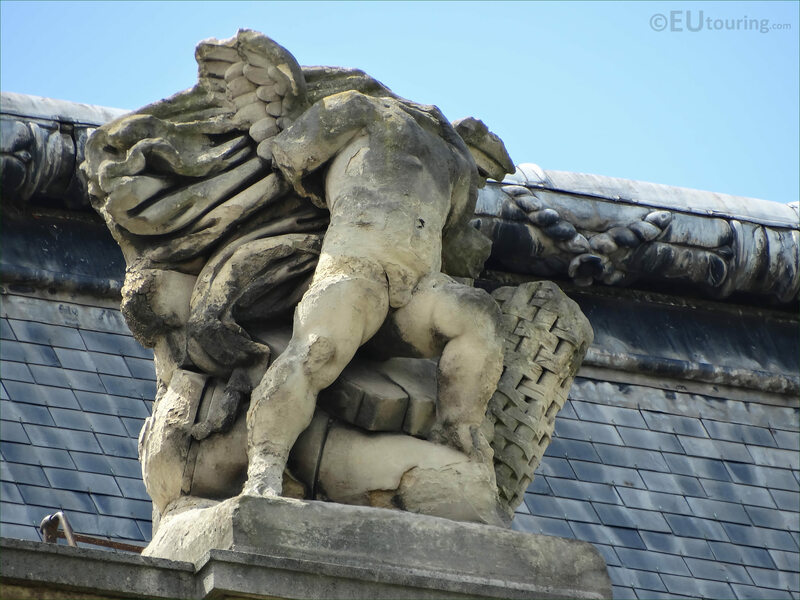 Unfortunately, as you can see from this first HD photo, the head of the winged child is missing from this allegorical statue called Guerre, which in English translates to War, but this can be found on the balustrade by the roof line of the Pavillon des Etats. And when you are looking at the facade of this pavilion from the courtyard of the former Palais du Louvre called the Cour du Carrousel, you will see that this is the seventh statue from the left hand side depicting a mythical child with attributes. Now this particular Guerre statue was produced back in the 1860s by Barthelemy Frison who was born in 1816 and studied at the Ecole des Beaux Arts to become a sculptor, first exhibiting works at the 1857 Salon, which led to commissions for tourist attractions such as the Hotel de Ville, Saint Eustace church, Palais Garnier Operand House and the Louvre Museum.